I grew up with a porch swing on both my grandparents front porch's and hubby gave me a swing a number of years ago for my birthday. It was in the yard for awhile, then moved to the back deck - but was never used as much as I'd like. I LOVE it on the front porch - it's on the far left in the picture below. My front porch has been seriously neglected for quite some time and after much family discussion we decided to correct that. SO, when St. Louis son visited recently, he and local son flip-flopped the metal furniture from the front porch to the deck and redwood furniture from the deck to front porch. The 'redwood' furniture that now occupies my front porch was on the back deck with REALLY old, ratty cushions. The chaise wasn't decent for humans to sit on as it had been basically a pet bed. Have you priced deck furniture cushions recently??? It has been a LONG time since I bought any and I definitely had sticker shock. Talking with a friend, she mentioned she had some old cushions she was going to get rid of - did I want them? Well yeah!!!! Her hubby delivered a huge stack of really big cushions. They were in pretty bad shape and much too large for my furniture. However, when I started taking them apart I found great insides. SO, a few yards of indoor/outdoor fabric, a some of her old cushions re purposed and I have lovely new cushions for my chairs - and enough left to make cushions for the back metal deck chairs too (thank you Barbara)! Now the furniture shows how seriously it needs a coat of paint - that'll come later in the summer. But in the meantime, I have a decent looking porch. I even bought some flowers (now if I can just remember to water them when the weather gets hot). And, don't you love my "welcome poodle" - he was a gift from a friend and is SO adorable. The little burlap wall cross was a another gift, so when I did all the other reorganizing I thought it might be time for the actual Christmas wreath to come down. 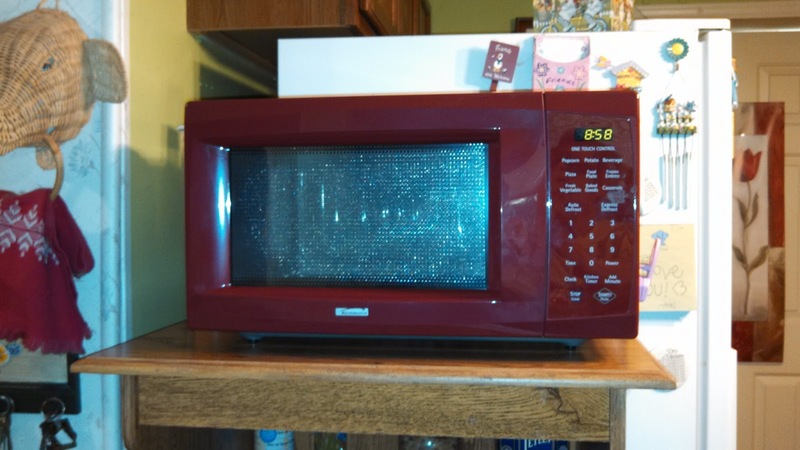 Who has a RED microwave?? 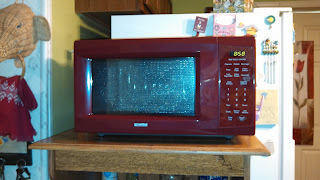 My old microwave was misbehaving most of the time, though it had been better since Ariel (granddaughter) prayed for it. So, the reason I "needed" a RED microwave..... In 2007 my old kitchen trash can finally died (it was only 20 years old) and I went shopping for a new one. I had a pretty blah kitchen, the old trash can had been brown, but a shiny red one caught my eye. I had nothing red in my kitchen, but I bought it anyway. One thing led to another and I wound up painting my kitchen a bright apple green and accenting it with red (to match the trash can). Son Asher & family got us a new set of cookware recently (have I mentioned I don't cook?). It's pretty though - RED. Soooo, I have a super spiffy kitchen that's bright and cherry! More fun to clean than the old drab one. Have I mentioned that one of my passions is counted cross stitch. We're so blessed in Guntersville to have a local shop - there aren't too many around these days. So, Irises Web has just finished a website for them. Check out Stitchers Haven and let me (or the shop) know what you think.